The lunchtime news on RTE One gave us a 15 minute interview with this retired British General telling us that Russia is planning to take over Central Europe by stealth - "has taken over Ukraine" (!) . He seems to be acting for the Yanks in that he promoted Obama's line that the Europeans don't pay enough for Defence. Lynne Boylan rightly put Mary Wilson back into her box over Wilson's **** a hoop and erroneous interpretation that EU advice was that Ireland was stuck with Water Charges as they were 'established practice'. Amusing. Mary is not used anyone bringing her a halt to her right wing line. One benefit is that the size of the economy in comparison to the national debt will improve. Ireland’s debt to-GDP-ratio will fall to 78%; it was expected to be 93%. At the height of Ireland’s crisis it topped 120%. You don't need Higher Leaving Cert maths to understand that you can't take a nonsense statistic and use it to generate a meaningful one. Horrendous even by RTE standards. Yep, new 2017 travel budget, by my count there are five TV and radio people on the road. Only the local corr is relevant. Who is running RTE News these days ? 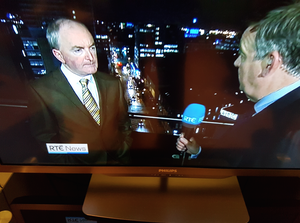 After a long break from seeing it, on return RTE looks like a Waterford Whispers send up of a national broadcaster. Brexit, the news gift that keeps on giving, has been barely covered (apart from Gov. press handouts on 'no border') on radio over the last two years. Fascination with John Delaney's financial affairs that have nothing to do with his ongoing divorce case (reportedly) has obliterated all else. Yesterday the 6 o clock news completely ignored the biggest news story of the day, the careless incineration of Notre Dame de Paris (described on RTE radio news as 'a theatre'). Today they are only one day late in reporting that Nancy Pelosi has suggested that the UK will not be able to make a trade deal with the US if it means a hard border/end of the GFA. What's up with them ? Or is this the new normal? ^ Ireland is a truly weird little country, so it is unsurprising that its national broadcaster is weird.